Chestnuts … Bad or Misunderstood? 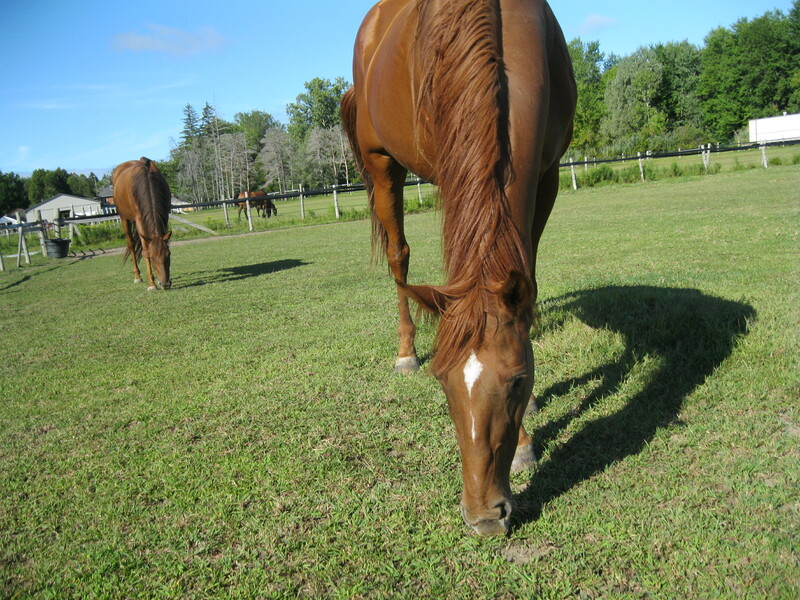 In my herd I have three chestnuts Thoroughbreds … one gelding and two mares. 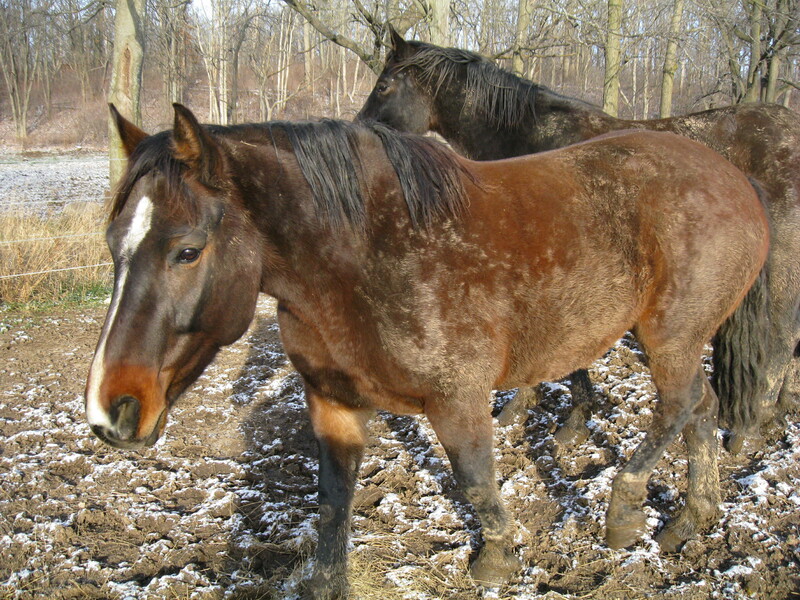 Two of the horses came from rescue situations and one from a family that purchased a mare to ride but was likely tranquilized during the trial rides and upon delivery. Once the tranquilizer wore off she was a miserable, bucking mess. I eventually traded them another horse to ride and took the mare off their hands as she became more horse than they were prepared to handle. She likely had serious trailer trauma in her history as she has scars on her flanks and legs and the sight of a trailer made her apoplectic. We began our journey from her current home to our farm with two sessions of 2 1/2 hours each at the back of my two horse, ramp load trailer. This is the first mare I have experienced who was so afraid that she “squirted” and kicked violently when anything touched her hind end inside the trailer. We got to the point where she would walk on and stand and quietly walk off. I then asked her to walk into the trailer with the centre partition up and closed the ramp. I thought we were OK until her bum touched the ramp … and she lost it … again. I managed to drop the ramp and back her out again and devised a plan “B”. I borrowed a three horse slant and removed all the partitions so it was a stock trailer and walked her on … put a flake of hay in the middle of the floor and stayed with her while my daughter drove us home. My job was to keep her from touching any walls for the 45 minute ride. She did great and we arrived home with no drama. Daisy has been part of our herd now for several years and is a perfect lady for those I partner her with doing ground work. Her work leading and lunging is very good and has become a great teacher to those learning horsemanship and doing leadership development workshops. She is trustworthy and kind … even forgiving to those on the learning curve of discovering the language of the horse. I find her pleasant … but quirky. She is difficult to catch some days but enjoys the “catch me if you can” game very much when it is played with skill and sensitivity. The reason I am blogging about her now is because it is time for her to re-visit the issue of being ridden. I did ground work with her tonight in bridle and saddle. I am sure this is the first time a saddle has been on her since I decided to bring her home. It was important for her to just be a horse and decompress here with no training agenda. The introduction of the saddle tonight made her quite anxious but we had no drama and she lunged well even with the stirrups down. I am looking forward to seeing her overcome the demons in her mind and become a good partner both on the ground and under tack. The principals Chris Irwin has taught me have served every horse I encounter very well. Healing wounds of the mind and emotions takes patience and an approach that is not agenda based … but based on the health of the mind first. This is why relaxation is at the very core of the work we do with horses. A true partnership can not be forced. Healing takes time and the journey there is rich if we are willing to stay in the moment with those under our care and who are looking to us for leadership and empathy. Chestnuts teach me how to sensitive to the sensitive. Chestnut mares teach me the value of encouragement for the small victories. Chestnuts are not “bad” or “difficult” … they are the ones who call us to a deeper level of awareness of the small details … because they matter. I love chestnuts. I will keep you up to speed as the training goes forward. I have been around the horse industry for quite a long time now … and I have watched horses being shanked in almost every environment from schooling barns to shows to private facilities. I think it is safe to say that all of us want our horses to be relaxed and easy going in their demeanor. The reality is that they get frightened, jacked up, angry, excited and can become quite the handful at times. This is what a horse is … by nature … it’s a fearful, excitable creature. Somewhere, sometime, someone made the decision that an effective way to bring this frightened, excitable creature back into a calm and happy state was to put a lead rope or chain over the cartilage of the horse’s nose … and pull violently. Most of the time I hear the handler say things like “settle down” or “calm down” or “easy” … all things that when put together with the action seem very counter to one another. I wonder what we would think if we got punched in the nose for getting excited or afraid. Would this bring calm? Would this bring you back to your happy place? Would it enhance the relationship with the one doing the punching? Where did we get the idea that this would be good for the horse? I believe in discipline. I believe in physical contact … administered with appropriate pressure on the appropriate body part for the appropriate infraction. It is more like a “bite” than a “beating” (and I’ve witnessed that too). I understand these are very large beasts and can become dangerous at times. I understand we want “control” of our animals for our safety and the safety of the horse. Shanking is bullying … plain and simple. Shanking is a fear driven response or an anger driven response not a tool for bringing a horse into a calm and focused partnership. There are tools we can use to calm a horse who has become difficult to handle. The key is knowing what triggered the behavior and dealing with that first. Eliminate the trigger … eliminate the behavior. It sounds simple but many horseman miss this. Resorting to predatory, abusive tactics with never get us what we want. It will never enhance connection, relationship or partnership … and will never truly calm a horse. If you need some of these tools, watch this site for clinics I am doing this year in your area. Come and ask lots of questions. Knowledge is power in dealing with horses. Our horses will always let us know the quality of the knowledge we carry into the relationship … are we listening?? Mack … to be groomed only. If you have ever been around a horse rescue or around horses rescued from bad situations you know the damage that can be done to a horse … both physically and mentally. I have the privilege of working with such horses and with the owners that love and care for them. Many of these horses develop behavior issues stemming from the environments they have come from and from their history with the people who have interacted with them. This is the story of Mack and Nicole. Mack was adopted from a local rescue and was branded a “groom only” horse because of his neurotic fear of saddle, tack and most people. He had a history at the rescue of either running away or body checking and running people up against walls … which made him quite a handful to be around let alone train. Nicole fell in love with (and felt sympathy for) this big, black and white paint and decided she would be his forever partner. She had him boarded at a local facility where she cared for his physical needs and dealt with his emotional baggage as best she could. She eventually called me to see if I would be willing to work with the two of them to sort out some difficulties she was having with not getting run down like road kill … daily. I remembered Mack from the rescue (as I trained there for a time) and remember having to take him from people who were getting beat up just trying to walk him around, so I had some idea what we were dealing with. We began our journey together (Mack, Nicole and myself) by beginning to help Mack relax, even for a moment, and we began enforce fundamental boundaries, like “don’t run me over”. My job as a trainer is to bring the horse’s anxiety level down as I bring the owner’s ability level up. Becoming a horse’s leader is a tall task especially if the horse has a history of poor human leadership (or abuse). Nicole began to learn and embrace the need for consistent boundaries fairly enforced and that what Mack needed from her was not always met with … thankfulness from Mack. One our biggest hurdles was getting Nicole to remove the “bubble wrap” (sympathy) and start approaching Mack’s training with empathy. Sympathy enables dysfunction … empathy is a path to true healing … but comes with a element of “tough love” that’s critical for the horse to develop trust. If you don’t “bite”, fairly and appropriately, you are not a leader in the mind of a horse. Just kindness and affection is not enough to help a horse find healing. Nicole was willing to go there … and was a wonderful example to Mack. We got through major fear issues with the bridle, surcingle and saddle. Long lines, on the other hand, sent him completely apoplectic. We had a scary moment in one session where Mack went catatonic and became completely paralyzed from anxiety. Nicole got his attention back without an explosion … but it was tense for a minute or two. As our training continued Mack proved to us what a big heart there was under all those layers of fear and mistrust. We continually pushed him to the edge of his envelope and helped him relax and enjoy the work we were doing together. As he got “worked up” we helped him “calm down” and taught him the physiological and psychological value of bending through the girth and spine. As he learned that he could relax in the midst of the work we continued to push him farther past his fear into a place of new possibilities. Nicole continued to care for his physical needs as well as his emotional needs between session and forged a beautifully balanced relationship. Part of Mack’s history included a very traumatic experience being ridden where he actually ran through a couple wood fences after an insensitive rider decided he was “ready to go”. He has been injured from being caught in a farm implement and a bunch of other stuff I can only guess at based on his neurotic behavior. To add to all of that, he lost the vision in his left eye from UVitis (moon blindness) … so mid training we had to change things to voice commands when on his left side. Mack still, despite all the obstacles, continued to show great heart and try. It was as if he was saying “we CAN get though this”. As his ground work continued to improve, mounting was the next item on the training agenda. Because of the history we knew about regarding riding, we took our time with this process. We broke things down into small, bit sized chunks for Mack to manage. I was probably ten to fifteen sessions just getting somewhere near the saddle (on his blind side) with my weight. We were told by his last trainer that putting your right leg on triggered huge explosions so as I bellied the saddle I put my hand down his right side and got him used to me being there. He was an explosive, twitchy mess … but we got through it injury free … both of us. Once the mounting process was complete and I was actually in the saddle we walked for short, issue free distances … one after another … session after session. Each walk we took was a bit longer and a bit more relaxed, although, I could feel the potential bomb under me the whole time. It was in one particular session at one moment in time that Mack made the decision that “I can do this … and I will be OK”. We rounded the corner at the top of the arena and his entire attitude and movement changed. His walk became forward and confident … and I asked if anyone watching had seen what just happened. (I had never experienced that moment so clearly before) So, because I walk that fine line between brave and stupid, I asked my daughter Briea (who was riding another green horse in training) to give me the rail as I was going for a trot. Briea mentioned something about me being out of my mind … and away we went. That trot is why I am in the business I am. It was as if most of the issues were now behind us and we could get to work training a “RIDING horse”. The “groom only” label was officially removed. I am extremely proud of Mack and Nicole for being willing to work through their issues and the commitment they both have to being healthy and whole. Their relationship continues to grow and Mack is one of the darlings of the barn. It is truly an honour to be a part of both of their lives. Last weekend I was asked to come to a horse rescue and pick up a horse for one of my clients. I was up the weekend before to have a look at him and give my opinion on the suitability for Tara (my client) to have and to train as a pleasure horse for herself. It is Tara’s desire to train her own horse (also her first horse) from the ground up … and I have great respect for that desire … because this is exactly what brought me to the decision to be a horse trainer myself. 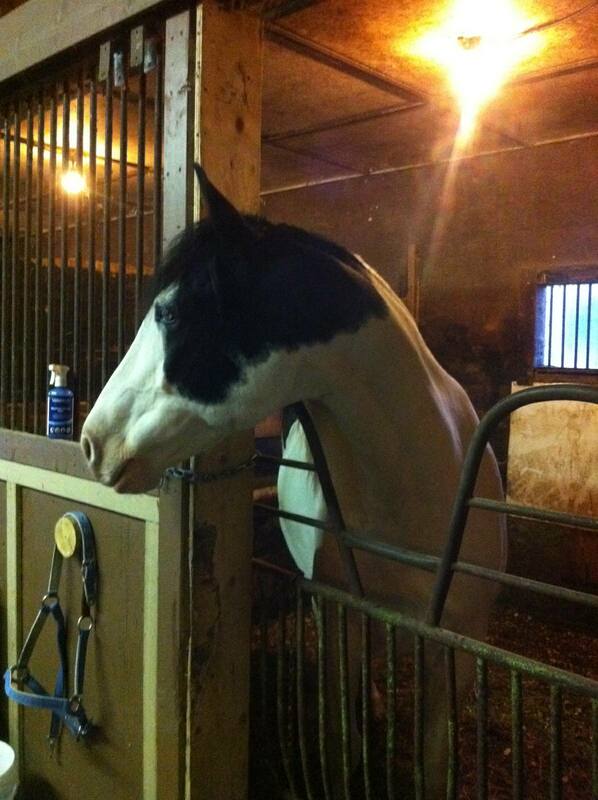 R2 is a 6 year old Arabian with a curious past. Apparently at some point in his short life he was kept in the basement of a house … and we were told he has issues with confined spaces … really?? Tara was told that he would be in a stall ready to go for her when she arrived at the rescue. When we arrived, though, we found him in the paddock where we first met him. My hunch is they could not get him into the barn and chose to leave him where he was for us to deal with. 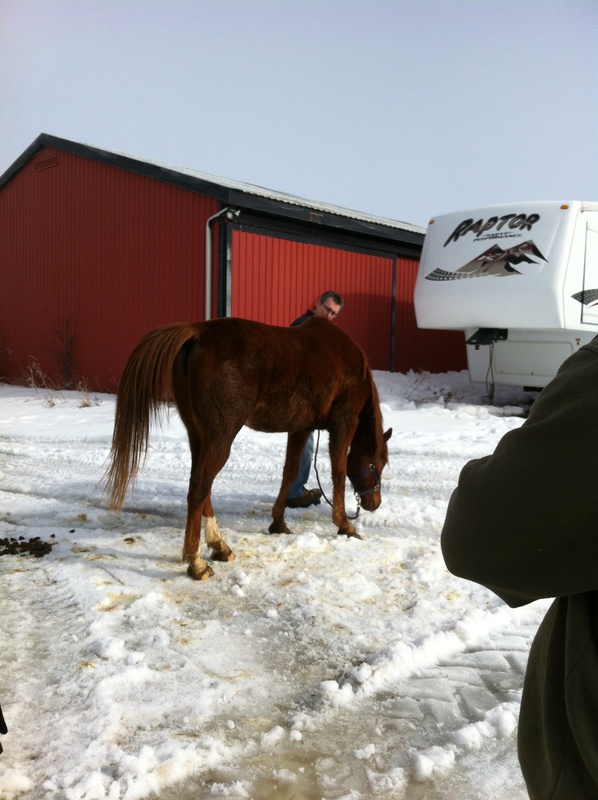 The photo shows where we started … taking him from two of his buddies eating hay. He was unimpressed to say the least. When I saw him for the first time (two weeks ago) I saw a young, confident horse who was very used to others moving for him and others bowing to his wishes … then, today, he met me. While I am not one who uses force to get what I want … I am also one who others (in the herd) move for. It is my place as a leader (or an alpha) to establish myself as one who is worthy of following. I DO NOT subscribe to the “show him who’s boss” philosophy as this is very predatory in its foundation. The game was now on. Two alpha horses competing for the number one spot. Two horses sparring to see who’s moves are best and worthy of respect. 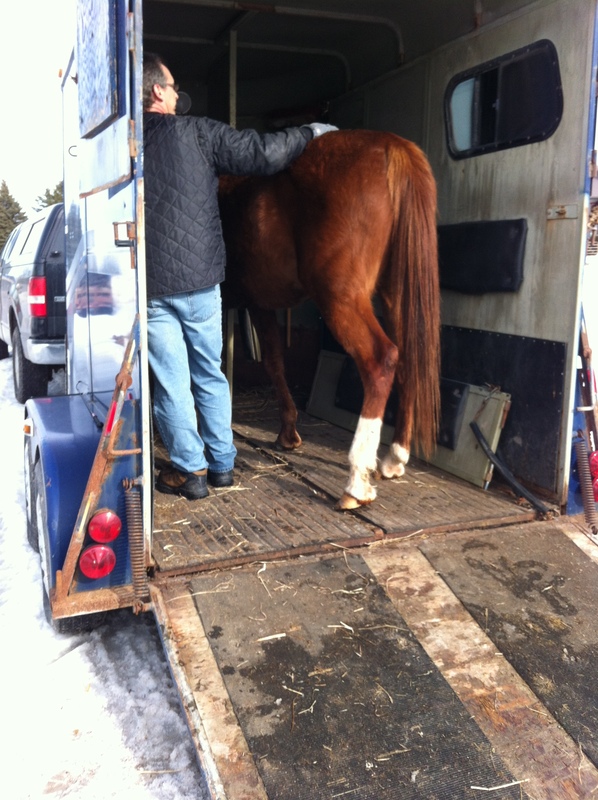 So here we are out of the paddock and he is dealing with things very well … but you can see the “game tail” is on and we were going to be in for a serious discussion regarding my desire for him to step head first into the trailer which is just in front of him. His head, however, is low and I am very happy with how he is dealing with the stress of the situation … confirming my assessment of being a confident boy. This is a good time to mention the fact that every cell in his body is against the idea of walking into a “cave” (trailer) with no visible opening to escape if he needs to. We often take for granted the things our horses do for us that are against what would be “natural” for a prey animal. To walk into a trailer and have the doors closed behind with no way to escape is a ridiculous request for an animal who’s primary defense is “flight” or the ability to run away. As R2 was faced with the opening of the trailer it was my job as the leader to manage his stress by keeping his head level or lower than level. This position helps the horse “feel” good and helps the nervous system work freely and efficiently. As soon and his head comes above level he is displaying stress and it becomes my job to manage this. Horses make associations with the environment they are in and the way they feel so I helped R2 “feel” good while faced with the fear of the trailer. “Frame of Body is Frame of Mind” is how Chris Irwin describes this principle. Keep the body in a shape that equals “no stress” and the mind comes into alignment with that shape. I allowed R2 to take baby steps into his fear as I stood my ground against his protests. He became quite violent during our time at the mouth of the trailer. He body checked me with his shoulder more times than I can count. He tried to knock my lights out with his head. He reared up and spun away (more than 40 times) and threatened to kick me with his back leg several times. He also tried to bite me a few times. I dealt with every protest with empathy and consistency. There were times when he just stood there doing nothing, processing his situation. I knew this was quite overwhelming for him so we took our time working through his fear … trying not to take his protests personally … but feeling for him and helping him move past the fear into that place of peace and trust in me as his new leader. 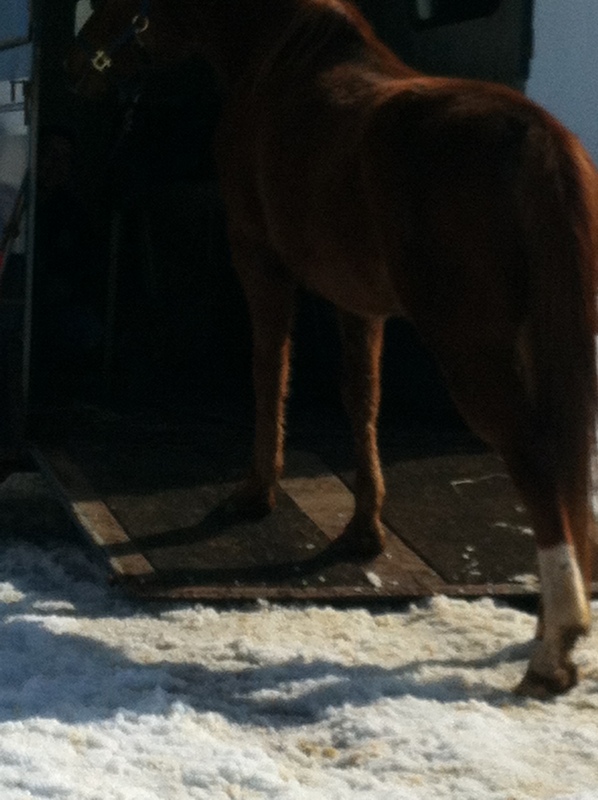 5 1/2 hours later … R2 overcame his fear and quietly walked onto the trailer and began to eat hay. He chose to back off one time and very quickly walked right back on and continued eating. I stood beside him for a few minutes deciding how I was going to deal with the closing of the ramp and top doors in the safest way possible. I knew there was the chance R2 could decide to jump out of the trailer once the ramp was up and get caught up half way out … so I stepped out of the trailer and started to lift it to see what his reaction would be. He took a step backward and I lowered the ramp and then calmly asked him to step back up to the front. I went into the trailer again and asked Tara to lift the ramp (from the side) with me in the trailer … and R2 seemed fine. We fastened the ramp up and he quietly turned around and looked out at his herd in the paddock. 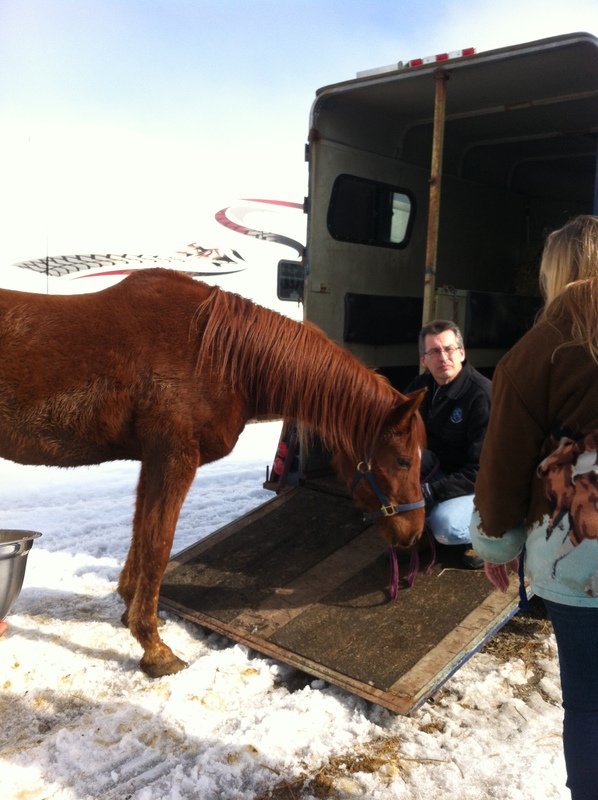 We were able to close the doors, put up the chest bars, hang the hay nets and leave for the 2 hour ride to his new home. When we arrived at his new farm we found him in the trailer still quietly eating hay. There was no sweat or signs of stress and he seemed very content. 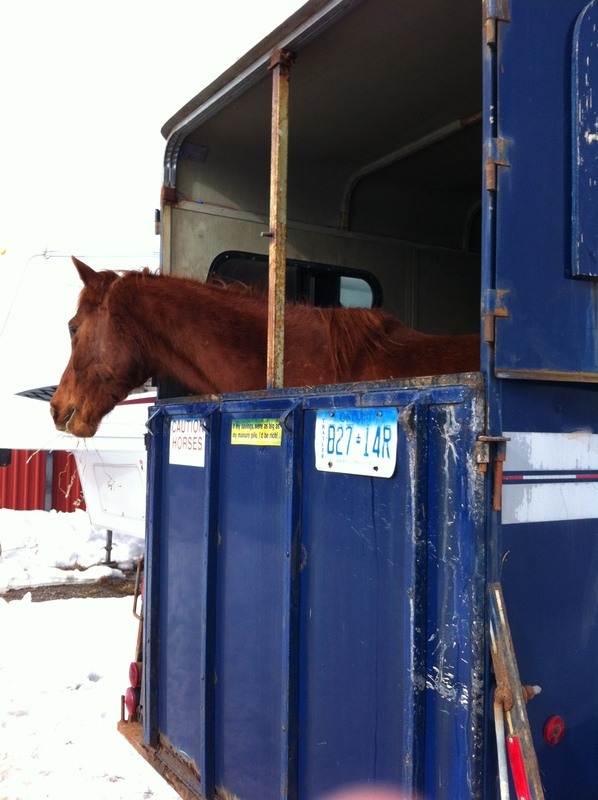 I opened the doors and dropped the ramp … and actually had to coax him out of the trailer. R2 lead on a loose lead all the way to the back of the farm like an old veteran and has settled in very nicely. This is the “shape” of a content and stress free horse. I was very proud of R2 when two days after his arrival at the new farm he was a perfect gentleman for the vet … getting his shots and examination. The vet was shocked when we told him he was an Arab as he was so “sensible” and easy to deal with. I am confident that R2′s training will go very well. We made very good progress into the training getting through the trailer issues and he proved that Arabs are indeed, very intelligent horses. It was critical that R2 was given the opportunity to make the decision to walk onto the trailer himself. Force would have destroyed any chance at a good relationship with me and his new owner and would have re-enforced his fear and mistrust of trailers and humans. Our journey has a good beginning and I believe R2 and Tara will become good partners and will take good care of each other. I am honoured to be a part of this as their trainer. I am finally getting the blog off the ground. 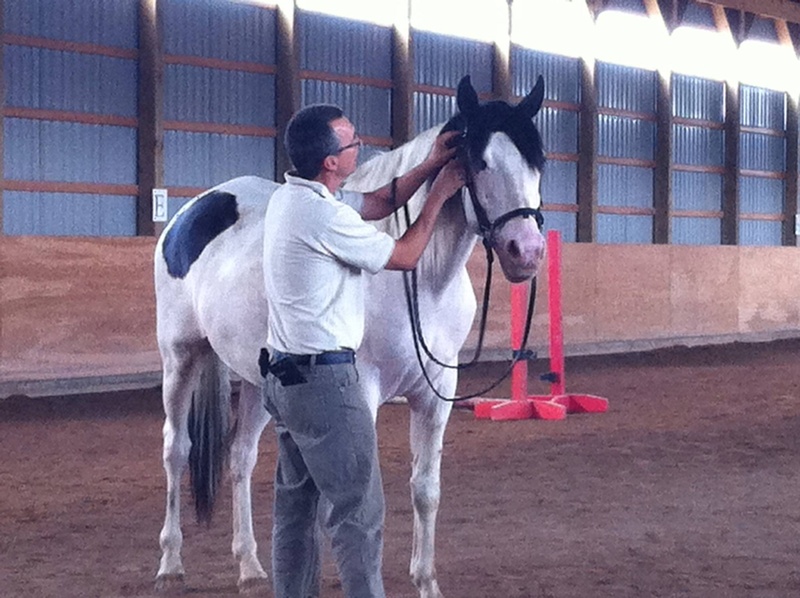 I will be sharing my experiences as I work with and interact with horses … and people … as a horse trainer. I am pleased to start with this little story of my relationship with a mare named Morgan. Morgan and I met December 8th, 2011. 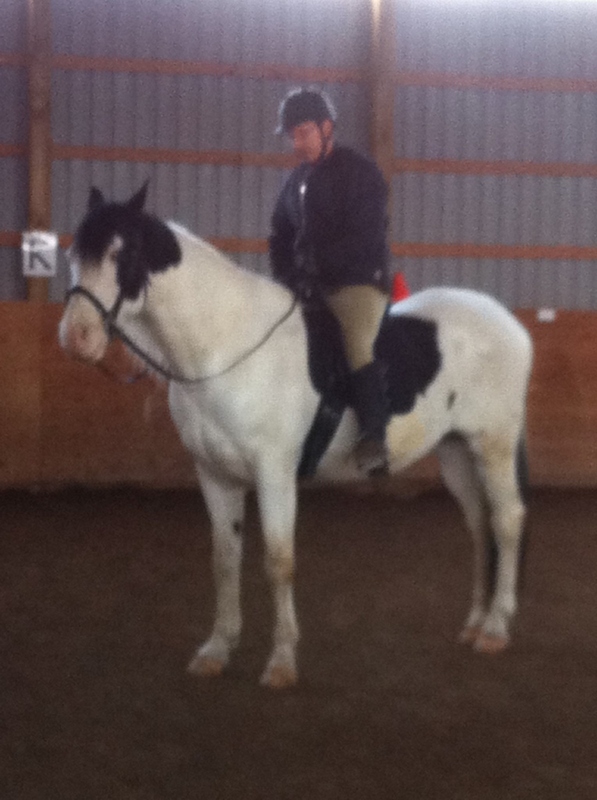 I have taken a position as trainer for a client who breeds Percheron/Thoroughbred crosses. I was asked to start with a group of 4 horses ranging from 4 to 7 years old. The target was to get them all going under tack ready to sell as riding horses. Rather than go in and choose a horse to start with I elected to just go into the paddock and interact with the horses … and let the first horse choose me. All of the horses were curious and came for a smell … and taste … but the one who came into me soft and polite … and passive … was Morgan. It turns out Morgan is the matriarch of this small herd. She was also the smallest at 16 hand 1,200 lbs or so. We started our time together in the arena and simply got to know each other. Soon after getting to know Morgan I found a number of issues we needed to work through. She would not allow me on her right side, she would not pick up her feet, she hated contact (bit and halter), she had learned to rear, she only lunged in one direction and she had very poor manners. In spite of all the gaps in her training I found her to be an engaging and sweet natured mare … most of the time. We just took things one day at a time and basically started from scratch. Working through the bumps in the road she has come a long way and is turning into a very quiet, steady trail horse with several hacks under her belt at this point. Last Friday I went out to get another horse (Sampson) who has real fear issues being taken out of the paddock and we have started working him through those issues. 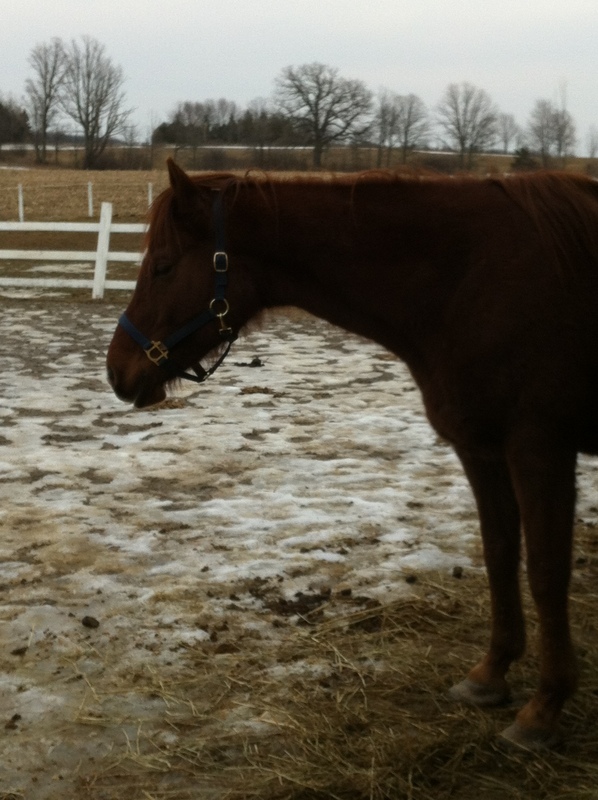 I decided to halter Morgan to see if Sampson would follow her to the gate … which he did. I proceeded to take the halter off of Morgan and moved toward Sampson. Morgan then turned and tore away across the paddock as fast as I have ever seen a horse run … mud flying 20 feet in the air behind her. Of course … the other horses followed … and there I was at the gate … alone … well me and my client … I won’t tell you what she said. Curious about the dynamic of what just happened, I went back out to where the group of them were. Morgan began walking away from me and turning her hind end to me. So I … as the Trainer/leader began to push her or herd her in amongst her herd. I then got her to stop … haltered her and began my trip back across the paddock. Morgan … in her special way … let me know this was not going to happen. She ripped back from me and as she hit the end of the lead rope, she then challenged me head on. She came at me with her shoulder and threatened me with her head … and I backed up. For those who know me and have seen me work with horses … I don’t yield to a horses push very often. The horse can perceive this as weakness or a lack of leadership ability. Morgan made me yield to her … and it rocked me inside. I quietly reached under her chin and unhooked the lead and she turned and ripped away once again. My heart was racing … and my ego was bruised. I went and sat in my truck for a few minutes to think about the situation and eventually decided it would be better to leave it for today and get some perspective in the situation. 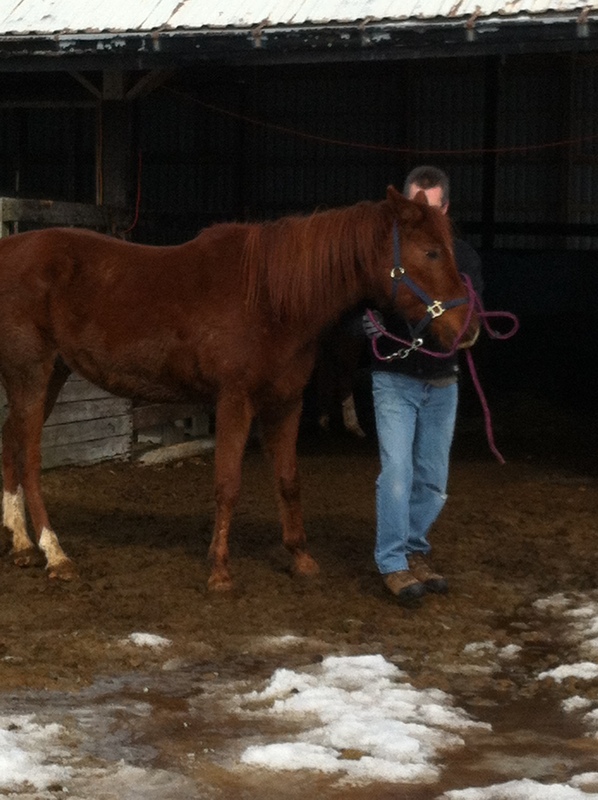 I went back into the paddock … took the halter off of Morgan … gently stroked her shoulder and left. I had the next two days to ponder Friday’s drama and came to this conclusion. My actions toward Morgan were very passive aggressive. I want you … I don’t want you. I truly ”USED” Morgan to get to Sampson and she called me on it. Christine (my client) and I have often talked about Morgan’s apparent jealousy when I handle the other horses. Had I gone back into the paddock and “got it on” with her to “show her who’s boss” … it would not have been about what was best for Morgan. It would have been about my ego and pride and would have eroded all the work we did in gaining each others trust and respect. If I am truly about what is best for the horses I work with … I need to take my lesson learned and be a better person/trainer for it. Whether you like it or not, horses are very blunt in letting you know how they feel about things … if we would take the time to listen … and put the effort into learning the language they speak … the connection we can make is incredible. If we get the message they send and become better for it, we ALL win. 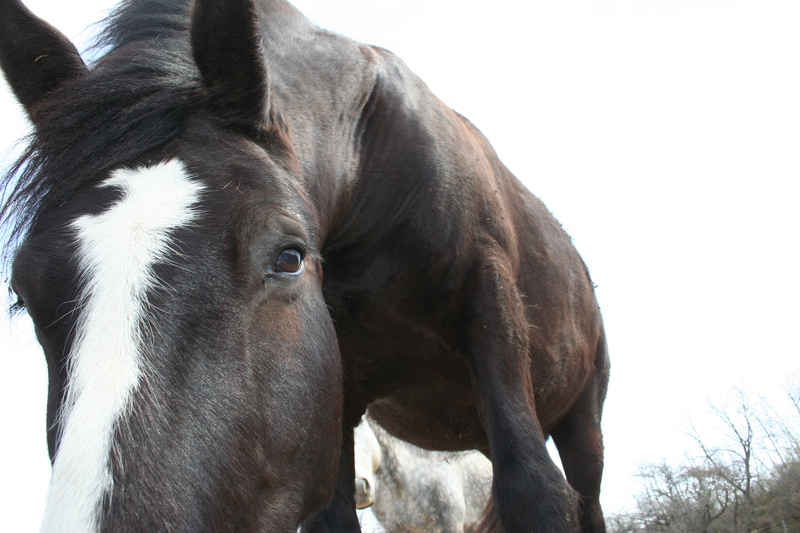 Morgan is a beautiful, sensitive mare who called me on my crap … and I listened … Thanks Morgan … Love you. Penny on Mack … to be groomed only.